Hundreds of bucket trucks from out-of-state utilities such as Southern Electric Corp. of Mississippi, and disaster logistics folks like Storm Services Inc., converged on Arkansas to help. We’re grateful to all the emergency workers who are giving up holiday time with their families. Today the power flickered a few times; here’s hoping the brief outages and clicks meant more people being reconnected to the grid. WINTER WONDERLAND — That is, until you have to drive in it. 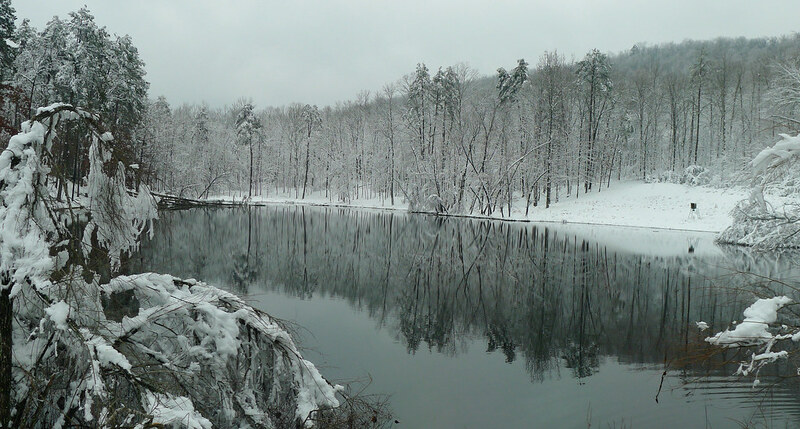 REFLECTIVE — The pond’s still surface mirrors the snow-covered mountainsides. GLASSED IN — Ice and snow coat a pine cone. SHIMMER — Winter can make even the sunshine seem cold. We hope your 2013 is filled with happiness! A few photographic snippets from 2012 in the Ouachitan woodlands of Arkansas. Fun with LED Christmas lights in January. Cormorants fill the water and branches around this cypress. Charlotte Schexnayder (seated, center) a giant in community journalism and former state House member, signs copies of her autobiography in May 2012. Remnants of Isaac put on a pretty good show heading into the Labor Day weekend. Temple Grandin visits with the media before addressing a packed house at the Arkansas 4-H Center in August 2012. Monarch dances with gulf fritillary during October migration. Soft October sunset at the pond. Christmas sunset in San Diego. Little Rock’s River Market on a winter’s night. Another better-late-than-never catch-up post. This time, it’s for the Dec. 21 WordPress Weekly Photo Challenge: Surprise. These bent and broken pines were just the tip of the iceberg. 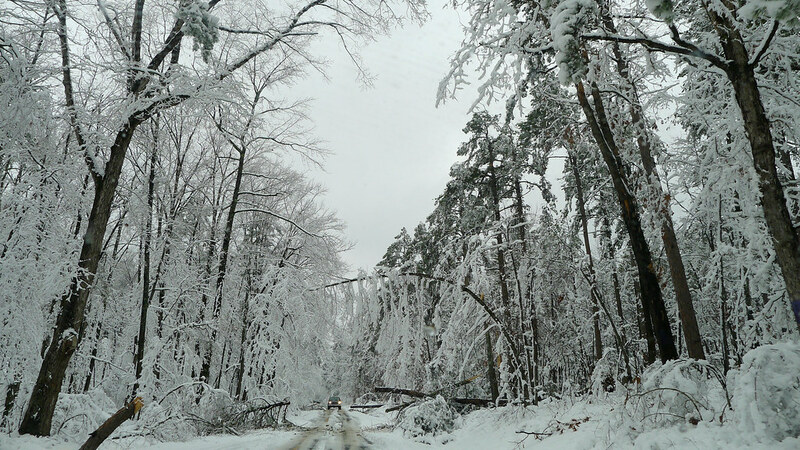 There were more than 100 broken trees further up the hill. Hole eaten into the delicate gills of a mushroom. What’s left of a root. A few day ago, we reblogged a post from the Arkansas Drought Resource Center showing the outlook for a white Christmas for most of Arkansas to be a long shot. Imagine our surprise in seeing this! Merry Christmas! Imagine that! Snow on Christmas in Little Rock! In a few hours, NORAD, the North American Aerospace Defense Command, will be tracking Santa’s progress as he makes his way around the Earth–even stopping at the International Space Station. It’s a tradition that spans many generations; from those who readied the house for Santa with in the time-tested analogue way: a tray of cookies and carrots by the fireplace, to the current generation who can follow him live online. For those who want to follow along, visit www.noradsanta.org/en/track.html. For me, “In the bleak midwinter” is one of the most hauntingly sweet, humble and hopeful Christmas songs. Gustav Holst’s melody can’t but stir the soul. However, after years of listening to the Madrigal singers at the University of Central Arkansas perform the piece, I was finally inspired to seek out the words. Adapted from a poem by Christina Rossetti, these lyrics are as moving as their musical setting. The beautiful YouTube’d version by the Gloucester Cathedral Choir includes lyrics. It’s worth a look and listen. The photo above was originally posted in 2010, and has become one of the most-visited posts on this blog. What are the chances for a white Christmas in your neck of the woods? If you live in Arkansas, don’t put any money on it, according to the National Climatic Data Center. The center has posted its probabilities. Normally, we’d post these photos on our sunset page, but last night’s view deserved front page play. CRESCENTS — The slender crescent of the moon rides high as a crescent of clouds turns red with the setting sun. Today is Gaudete Sunday, the next-to-last Sunday in Advent. Advent, like Lent, is a time of introspection; a time to prepare the soul and mind. Advent encompasses four Sundays in anticipation of Christmas and Lent does the same before Easter. A trend we’ve been seeing in the pews is parishioners embracing the colors of the season. At the Saturday vigil Mass, the pews were filled with men, women and children who had worked rose or violet into their Sunday (or Saturday) best. It’s a powerful external symbol of the inner states that Advent and Lent are meant to touch. The rose candle is lit for the third day of Advent. Light from the candles shines through a glass shard.